We offer special sensor for car parking which makes the parking more systematic. - Digital LED Showing obstacle distance. - Color VFD display for the digital and direction. - Alarm by English speech. - The Simulative vehicle is displayed for front and rear, left and right. - Rear view mirror for the display, it clips on the exist mirror inside the driving room. Backed by well-developed and advanced technologies, we offer an extensive range of Car Parking Sensor that is functionally advanced in nature and is valued across the nation for its high efficiency and durable results. They ensure clear LED display unit and is able to cater diverse requirements of the clients across the nation. 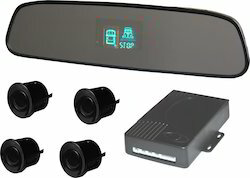 We offer a wide range of Mirror Parking Sensor.It Detects objects while reversing. Also, Display on rear view mirror. These sensors are Ultra variable florescent display. This Light illuminating back sensors. Display by digit, direction & voice. Mounted on original rear view mirror. In-Car Sensor is available here. 4 sensor system, double CPU and advanced chipset for enhanced coverage and detection (0-2m).